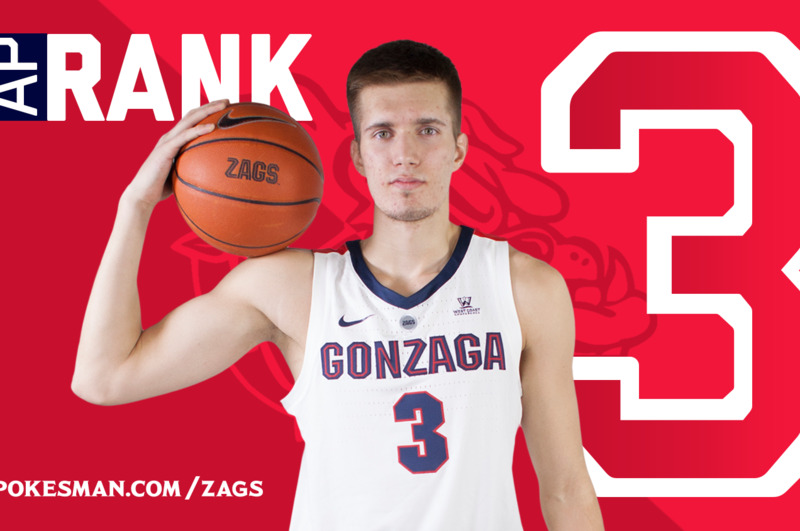 UPDATED: Mon., Feb. 11, 2019, 10:45 p.m.
Gonzaga’s slow climb up the AP men’s college basketball rankings took another step forward Monday. After a three-week stay at fourth, the Zags moved to third following two more decisive wins and Virginia’s second loss to Duke in three weeks. The Blue Devils weren’t able to dislodge Tennessee from the top spot but they did cut into the Volunteers’ lead. Tennessee received 40 first-place votes, down from 48, while the Blue Devils earned 24, doubling last week’s total. Virginia dropped to fourth, 51 points behind the Zags. The more important numbers pertaining to the postseason are Gonzaga’s standing at No. 1 in the NCAA Evaluation Tool (NET) ratings and landing the top seed in the West Region when the NCAA released its initial bracket projections Saturday morning. The NET is one of the selection committee’s main tools for selecting and seeding tournament teams. There are other factors considered, which was reflected in the bracket projections. Virginia was No. 1 in the NET on Saturday, but No. 3 Duke earned the top overall seed. Virginia Tech, No. 10 in NET at the time, wasn’t among the top 16 seeds. Marquette, No. 21 in NET, was projected as a three seed. The Zags obviously won’t have as many opportunities for high-profile wins over the remainder of the regular season and the WCC Tournament, but the conference still has four teams in the NET top 100 (Saint Mary’s 50, San Francisco 52, San Diego 100). Gonzaga spent a couple weeks at AP No. 1 after defeating Duke to win the Maui Invitational, but slipped to No. 8 in mid December after falling to Tennessee and North Carolina. The Zags have responded with a 14-game winning streak, prompting a methodical rise in the rankings. Kentucky, Michigan, Nevada, North Carolina, Houston and Marquette completed the top 10. Washington nearly cracked the top 25 last week but slipped to fourth in the receiving votes category with 17 points. The Huskies defeated Arizona but suffered their first Pac-12 loss to Arizona State. There could be more movement in the top 10 considering this week’s schedule. Tennessee visits Kentucky on Saturday. Duke visits No. 16 Louisville on Tuesday and entertains rival North Carolina on Wednesday, Feb. 20. Gonzaga also moved up to No. 3 in the USA Today poll. Tennessee picked up 30 of the 32 first-place votes. Duke is second, 34 points ahead of the Zags. No. 4 Virginia is 45 points behind GU. Kentucky, Nevada, Michigan, North Carolina, Houston and Marquette round out the top 10. Published: Feb. 11, 2019, 9:58 a.m. Updated: Feb. 11, 2019, 10:45 p.m.